In the ongoing re-release campaign of Genocide Organ’s back catalogue, the time has finally come for Save Our Slaves to receive due attention, with this expanded compilation format already having been many years in the making. Save Our Slaves was first released on Tesco Organisation in 1991 (as Tesco04, and now already 26 years old), and is the central element to this re-release. In context of Genocide Organ’s discography Save Our Slaves arrived as the second album for Genocide Organ and followed their debut Leichenlinie released two years prior in 1989. Although the impact of Leichenlinie in undeniable in first establishing the group, Save Our Slaves stands out as a landmark release that cemented Genocide Organ’s cult underground status and particularly highlighted their willingness to present potentially controversial thematic material without explanation or qualification. Noting that the original format of Save Our Slaves contained a 12”LP & 7”EP (six tracks totalLing around 35 minutes of music), rather than simply re-releasing that material Civilization constitutes a complete re-contextualization of original content. Here the set has been substantially expanded with the inclusion of the two tracks from 1998’s Klan Kountry 7”EP, and a further five tracks taken form various compilations from 1991 to 1997, along with a further LP that documents the audio of a live performance from 1990. Cleverly all additional content is conceptually tied together by having a similar American thematic focus, the original title has been altered to ‘Civilisation’, which itself takes its title from the live performance video Save Our Slaves: The Rise Of American Civilization, which was only included with the ultra-limited special ‘metal box’ version of Save Our Slaves (limited to a mere 18 copies). Thus, with the inclusion of additional material spanning the years of 1990 to 1998, it functions to seamlessly ties together these scattered thematic threads under the Civilzation banner. With reference to musical content, obviously Genocide Organ’s prototype, aggressive, and barely restrained power electronics forms a large proportion of the musical scope, which involves rumbling noise, blasting static, loosely composed oscillating forms, and antagonistic distortion drenched vocals (i.e. Kill Useless Nations, Klan Kountry & We Grow). Alternatively, other tracks function to cover the industrial-noise styled approach of the group, such as is displayed on Patria Y Libertad, Search for a Place to Die & Violent Coordinating Committee. Likewise, the throbbing rhythms, cinematic synths, squelching noise, and sweeping drones of selected compositions see Genocide Organ operating at their most melodic, such is the case with I Want James Meredith & Weg Der Verlorenen). Last of all, John Birch Society (a highly recognisable track within Genocide Organ’s canon), is a clear standout with its simplistic structure, crude but almost upbeat programmed drum machine, aggressive distorted vocals, and further treated with harsh noise. On the third live LP Live At Lever Sunlicht / Mannheim 15.12.90, this is the audio from the Save Our Slaves: The Rise Of American Civilization VHS, where the production is raw and harsh as one might expect for a live recording from 1990. Yet despite the harshness of the sound, the set list does not constitute an all-out jugular attack, but rather it opts for a series of industrial noise soundscapes, vague shuddering factory rhythms, squelching noise, and snarled vocalisations. The final chaotic triptych rounds out the live recording and, in the process, amps up the mood more towards an expected power electronics assault with Patria Y Libertad. For the packaging and presentation, no attempt has been made to recreate the special format of the original box-set, which was a rough painted, hand assembled cardboard box with banderole striping, pasted image and text stickers, combined with additional inserts. Here an entirely new box-set design has been devised, which involves a newly designed outer slip box in which three single LP’s/ jackets are housed, along with a fourth LP jacket to house the 24 page A4 booklet (which fleshes out the thematic context), along with a series of three printed inserts and a woven patch. With the presentation following Genocide Organ’s recognisable design aesthetic, and while completely different to the original Save Or Slaves presentation does absolute justice to the expanded set. Considering its original impact in 1991, coupled with its revered status today, Save Our Slaves stands out as the landmark release that definitively executed each hallmark element of sound, visuals and strong and uncompromising thematic content with flawless accuracy. 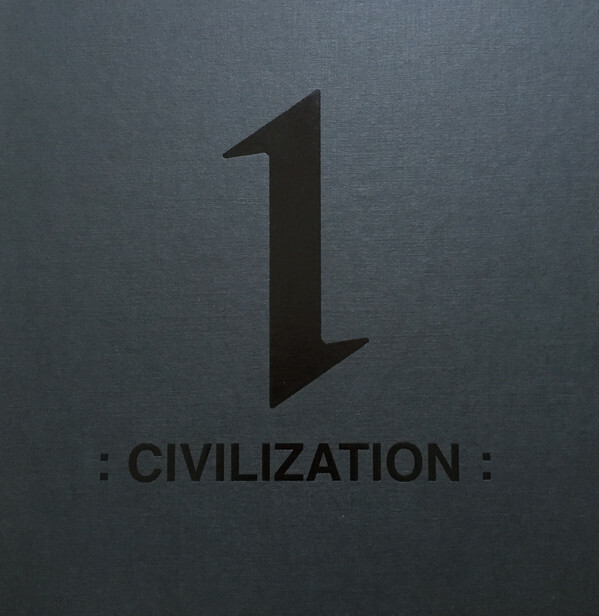 As a re-contextualized version of this Genocide Organ classic, Civilization can easily be categorisaed as another celebrated addition to their illustrious discography. Already sold out in its vinyl version (limited to 500 copies), a double CD, A5 sized cover and 24 page booklet* housed in an outer slip-case will have to suffice. * – in full disclosure, I was asked by the group to write a separate article about this box-set. Parts of that text were used as the promotional text for this release, and short fragments of it were also used in the booklet to provide further thematic context. To speak of this collaboration between Troum and Raison D’etre, surely at this point they do not require any sort of detailed introduction. 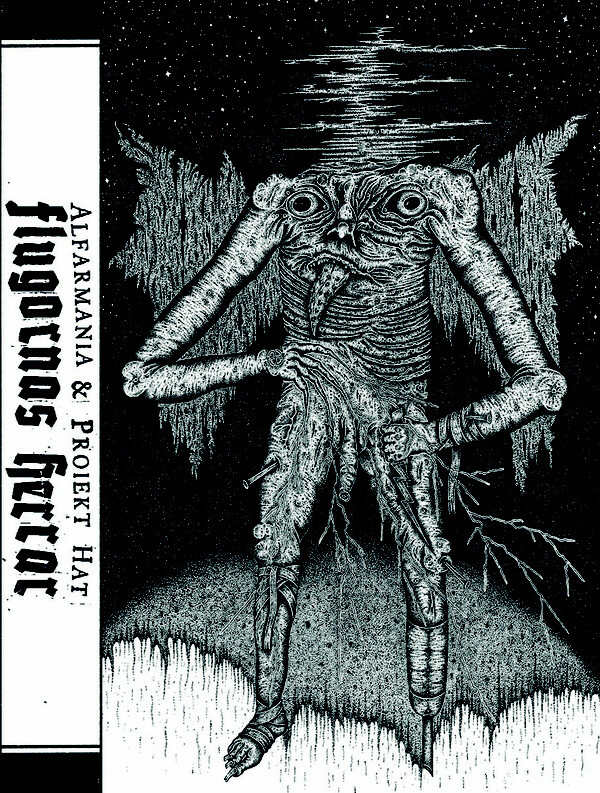 This is their second collaboration CD following De Aeris In Sublunaria Influxu from 2015 and evidently will include a third as part of a trilogy. Having heard the first collaboration, it can be regarded a decent album overall, but a general observation to be made is that it does not really amplify individual strengths, rather tends to reduce them into a more ‘typical’ dark ambient/ drone album. This however is not the case the with XIBIPIIO. In And Out Of Experience, which accordingly to sleeve notes is: “A creation of 9 separate “worlds”, existing only at the moment you immerse into it”. Certainly this is a very succinct way to describe the key strength of this album. Obviously in approaching this as a collection of individual tracks or musical vignettes, the opening drone oriented track In den Wellen, ein Sehnen demonstrates a greater degree of drive and sonic animation than the first CD. This sense of drive and movement continues with The Machine Starts to Sign, which features a looped and heavily tribal percussive thrum set against roiling background drones. Also of interest, selected tracks lean more heavily to one or the other projects individual sound, such as on Eigi Einhamr, where the sweepingly bitter-sweet drone-scape is more typical to Troum’s influence, while others such as Hang’-E-Lah has the detectable bleak melancholic edge and contact-mic metallic timbres are more typical of current era Raison D’etre. Dreiklang Aus Äther then charts a careful mid-point between the sound of both projects, including the lush swelling drones of Troum and the sacral ambient elements of Raison D’etre (including sampled and treated choir styled vocals). Late album track Expulsion of the False Self is another sonically animated piece featuring a driving looped bass rhythm, wailing type horn elements and swelling forceful drones and even an accordion thrown in for good measure! Overall I have found this second collaboration CD from Troum and Raison D’etre to be more immediate in its impact and also perhaps aligns more closely to what I would have hoped or expected from a collaboration between these two heavyweight of the dark ambient and drone underground. While drawing from the sonic palate of both projects, here it amounts to something much more than ‘just’ a merging of their individual sound and approach. The stunningly detailed and multi-layered artwork of the 6-panel digi-pack rounds out the presentation of this very much enjoyed album. Now that The Grey Wolves have ceased activity, former member Dave Padbury will be continuing in solo guide under the Salford Electronics moniker. In then noting that Salford is a suburb of Manchester, UK it may be reasonable to assume this is where Dave resides and it has duly informed the project title. 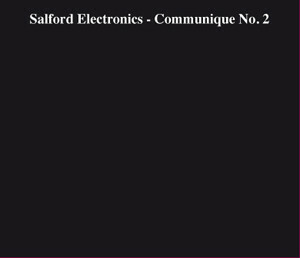 Perhaps of note, this debut Salford Electronics album was released a couple of months before The Grey Wolves final album Exit Strategy (reviewed here). Now having had a chance to listen to both albums in detail, there appears to be clear conceptual linage between the two (and perhaps this observation better frames Exist Strategy as being an album strongly influenced by the current sonic mind sent of Dave as evidenced on Communique No.2). Likewise, with reference to the soundtrack/ soundscape style of Exit Strategy, this mood also threads through Communique No.2 albeit in a far more controlled and ambient guise. The promo blurb also draws such parallels given its description of: “Salford Electronics is the follow up to The Grey Wolves – Communique 2 is a perfect Interzone eternal night noise or neon rain-soaked stalker science fiction vibrations for would-be blade runners, A soundtrack to the hollow hours empty of sleep”. Although ultimately differing in sonic execution, Communique 2 and Exist Strategy are two albums which work rather well together, given they explore similar thematic territory, but with slightly differing sonic result. Given that Communique No.2 spans 41 minutes across ten interlinking tracks, it is best taken as a complete musical work. As such it is an album that is darkly moody and which sonically articulates a dystopian malaise of the dead hours of night, where the atmospheric industrial-noise/ dark ambient soundscapes slowly ooze forwards in a minimalistic and cinematic guise. 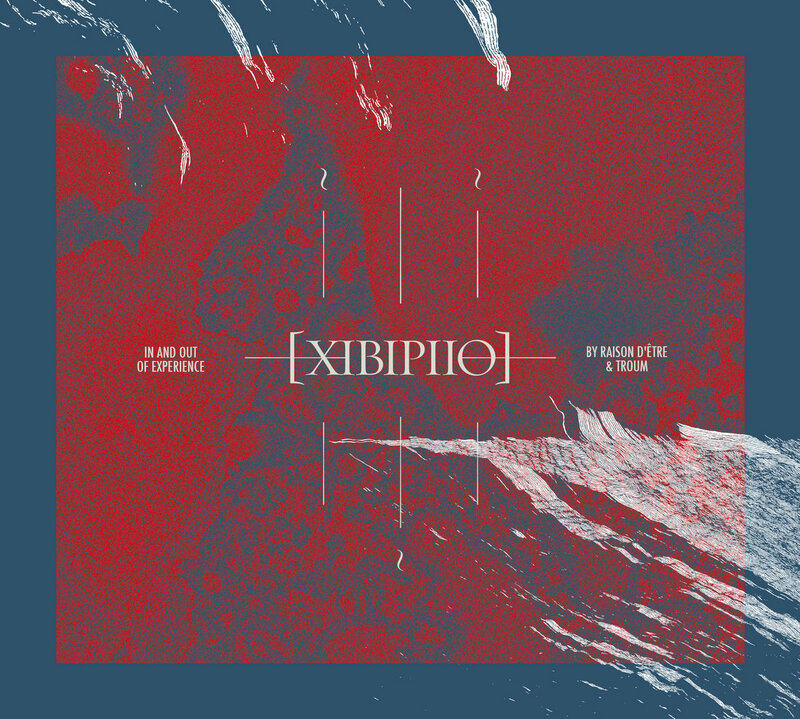 Here darkly moody elongated drones mix with sparse washes of noise, buzzing distortion, semi-buried rhythmic elements, but all the while maintaining a controlled and minimalist tone. But not being of studio construction alone, Prestwich is constructed around dank urban field recordings, minimalist electronics pulses and semi-buried radio chatter. Yet to speak of differences, This Sickness positioned at the centre of the album differs from the bulk of the album given its programmed/ electronic rhythmic structure. With the effective ‘non-existent’ album artwork giving no visual reference points, it functions to redirect all focus on the musical framework, which reveals a highly detailed work of dank minimalist atmospherics and interspersed with occasional moments of biting tensile sonics. The fact that such a strong solo project has emerged from the ashes The Grey Wolves should be welcomed news, and hopefully bodes well for more high caliber material being delivered by Dave Padbury via the Salford Electronics moniker. Recommended. So here we are, 14 years on from the last official Grey Wolves album Division released in 2003. Being many years in the making, Exit Strategy has also been announced as the final album from this long standing and rather revered group, with its release also coinciding with their final live ‘action’ at Tesco Organisation’s 30th Anniversary show in Mannheim in October, 2017. So as the saying goes, “all good things must come to an end” – and end they have, but not before this ‘exist strategy’ was devised. Having spent some time becoming acquainted with Exit Strategy, from the outset there is no way of getting around the fact that the sound of the album is not representative of what would typically be expected from The Grey Wolves. This comment is then made in full acknowledgement that the project has over their 30+ years of activity covered a diverse range of sounds, which has included: atmospheric dark ambient; murky industrial noise; and harsh power electronics. However much of the perception of Exist Strategy not sounding like The Grey Wolves comes down the general cleanliness of the sound and the clarity of the production. This situation would then seem to be somewhat explained by the album’s liner notes that: “Exit Strategy was produced, mixed, mastered with additional audio and artwork by Jerome Nougaillon” (aka Propergol – and perhaps tellingly if Exist Strategy were played to me without being told who it was, chances are I would have said it sounded like the sharp and clinical approach employed by Propergol). So, although far from confirmed, I suspect that Jerome had a central role in the creation of this album, and this may have gone as far as being responsible for reworking and finalising a range of source material and/ or unfinished tracks from the group. Whether or not the truth on how the album was completed comes to light, remains to be seen. To then speak of the album’s construction and flow, it is an instrumental and soundscape oriented in style and approach. A heavy dystopian mood and cinematic atmosphere permeates the album, where this perception is duly confirmed by the promo blub which states: “The soundtrack to an as yet unmade Hong Kong splatter movie. A seemingly endless march through cinematic urban decay. The original sound reduced to its basic structure through loops, repetition, distortion and other alienation techniques. it’s time to think about an Exit Strategy. The sodium orange hours of the city make you believe in the apocalypse”. Yet given the ‘soundtrack to a non-existent film’ format, there is also a conspicuous absence of the trademark vocals which are without doubt a sorely missed element. But to speak of specifics, the opening track In Our Time is a strong and tensile introduction based around pulsing textures, driving drones, a lone pounding ‘beat’ and mid-toned static shards. The Precinct then steps up a notch in urgency with a shuddering obliquely rhythmic framework with is further coupled with radio chatter for further cinematic effect. Another track worthy of individual mention is In Too Deep with it scattered sweeping textures and sparse programmed ‘Morse-code’ type rhythm. Seizure then deviates completely from a recognized sound, given its hard pounding programmed beats and static blasts resembles a type of industrial techno along the lines of Alberich (and for this reason alone is likely to be the most divisive track on the album). In rounding out the album Flatline uses a prominent movie dialogue sample of Samuel L Jackson, and while for me personally it negatively jars the overarching mood and would have been better excluded altogether, thankfully it is used only once and not repeated (as often dialogue samples tend to be in this type of music). Sonically speaking this track is a tensile blend of jarring (digital?) noise, sporadically rhythmic outbreaks and doom addled atmospheric drones. Although this review may on face value appear to be overly critical, such commentary should be taken more as observations which highlight the clear differences between initial expectation and the actual reality of the final The Grey Wolves album. Ultimately Exist Strategy IS a strong and enjoyable album in its own right, but can only be acknowledged after getting over the initial expectations of what you may want it to be. 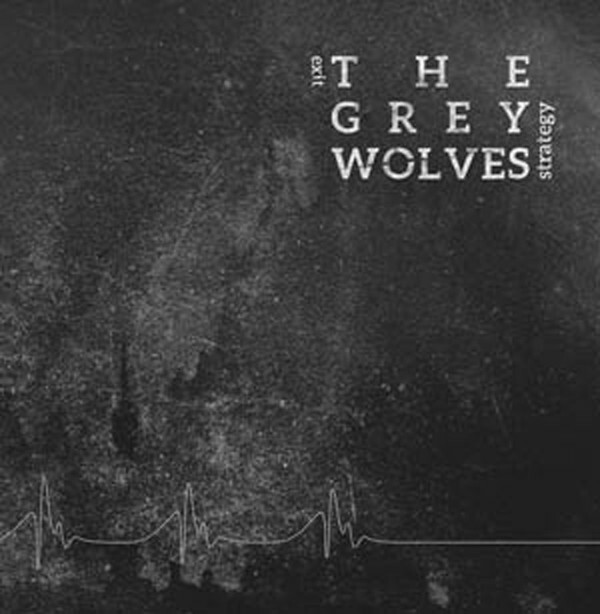 So, if you are able to divorce yourself from expectations that this album should be something like The Grey Wolves’ magnum opus, and instead simply approach it for what it is, some excellent material awaits and functions as a sort of unexpected addendum to their established and celebrated legacy. Although I was previously aware of this mysterious Swedish project, I have not had an opportunity to hear them until now, which was basically due to not being able to track down a copy of their limited debut tape. 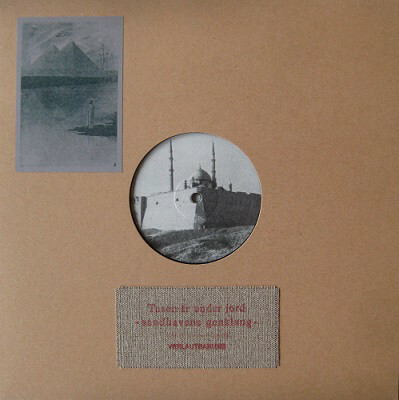 Given the debut tape Sorgsendömet Fobos from 2013 was described as one which “transcends the border lines between drone, ambient and dark echoes of the past”, this follow up LP is noted to be a different beast altogether. Sonically speaking Sandhavens Genklang is rooted in a ‘exotic’ middle eastern sound, where it would appear this album is constructed from sampling and looping fragments of old and forgotten records which were otherwise reconciled to the dustbin of history. In resurrecting fragments of those sampled records, the music is mostly framed around prominent elements of hypnotic tabla percussion, melodious woodwinds, bowed traditional string instruments, wailing horns and tribal chimes, which generates an atmosphere of a dusty and bustling market place in some unnamed city in ancient times. The sampling of old records also means the finished recording contains prominent ‘artifacts’ of hiss, pop and crackle which adds to the sonic allure and general sense of sonic mystery and sets the tone far form being modern digitally produced recording. On the visual front, the cover also exudes an exotic flavour, with the project name and title printed on a piece of cloth affixed to the cover, along with a postcard featuring a drawing of the pyramids of Giza and what may just be a UFO hovering above. Essentially the strength of this release is it completely transcends any genre confines and thereby completely skews associated expectations to reside in its own musical sphere. Although being a highly atmospheric recording, equally it is not overtly ‘dark’ in mood, but does contain a quite uniquely exotic vibe and aura which will appeal to the sonically curious who are looking for something divergent from the usual underground ilk. Recommended.